Several authors came to mind then and there. Others came to me later, when I had finally woken up. 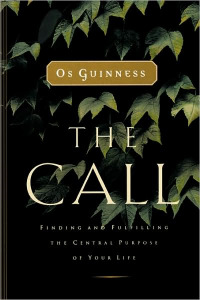 As a Christian speaking on the topic of calling, it's hard to to ignore Os Guinness's contributions in his book, The Call. It's a helpful work from a sharp mind, and I've been impressed to hear how many friends who studied at Christian schools around the States read it in class. I've actually enjoyed discussing calling with Os in person more than once. A blind spot in many Christian conversations on calling is the German theologian and pastor, Dietrich Bonhoeffer. While there have been a sudden wave of Bonhoeffer biographies in the past few years, there's still much work to be done on the unique contributions he brings to the conversation on calling. For example, Bonhoeffer's life begs the question, What in the world does it mean in terms of calling for a Christian pastor to take part in an assassination attempt? What did Bonhoeffer himself think it meant? And what does that teach us about what it means to be called? Bonhoeffer's Cost of Discipleship is an oft-quoted book on this topic, and rightly so. But the topic of calling is found repeatedly throughout Bonhoeffer's sermons, in his Ethics, and other works, as well as, of course, his very life. Much to be mined here. I still remember reading Parker Palmer's classic book, Let Your Life Speak, as a college freshman more than a decade ago. It's a quick read, but dense in wisdom. And the best part, in my opinion, is that the topic of calling is considered not in abstraction but within the context of Palmer's own life and his personal struggles with the questions of calling and vocation. Very helpful. And, of course, there's Frederick Buechner. The Presbyterian minister, novelist, and memoirist has much to say on the topic of calling, in a number of different works. There's his memoir on the question of calling and vocation, Now and Then. There's also The Alphabet of Grace, and Wishful Thinking, which supplied the poignant introductory quote for my own book, Called. I look forward to considering each of these works in turn over the next few weeks and sharing some thoughts on what each author has taught me on the topic of calling. In the meantime, what do you think of these recommendations? Agree? Disagree? What's missing here?